Kawabata Makoto believes he is more of a cosmic translator than a musician. Trying to make sense of the sounds he has heard inside his head since he was a boy, Makoto believes that his reason for existence is to tune in and share these sounds with the world. 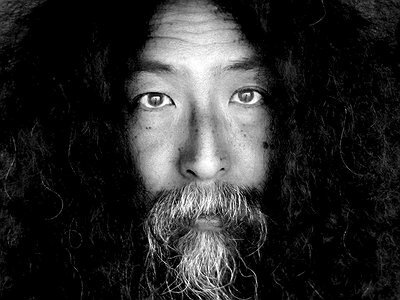 Hailing from Osaka, the guitarist rose to fame with the psychedelic sounds of Acid Mothers Temple & the Melting Paraiso U.F.O. and the noise of Mainliner after years spent making music on hand-made instruments. While Makoto might have been distracted with abstractions in years past, he is now firmly in tune with his own journey, trying ever harder to play the music of the spheres as it should be heard. When did you start writing/producing music and what or who were your early passions and influences? When I started to play music with handmade instruments in 1978, I also started to make music at the same time. But I don't want to use these words "make" or "compose" for my music, 'cos I’ve been just like a radio tuner. I can hear music from my cosmos, so I just try to play this music without any of my personality getting in the way. I hear music in my dreams, and of course music in my cosmos. The moment I wanted to add my personality to music from my cosmos. I have to have selfless devotion to music from the cosmos if I wanna be a good radio tuner for it. Case by case, moment by moment. I wanna concentrate irrespective of units in each moment. When I can hear music from the cosmos. Improvise, compose, arrange, play, it's all the same for me, so all of my music is improvised. But strictly speaking, my music comes from the cosmos, so I can't really use the word compose. My cosmos tells me everything, what and how I should play. That’s all. Same answer again. My cosmos tells me everything what and how I should play. That’s all. When I play music for recording, when there's no audience in front of me, I work just for me. But if there's an audience front of me, I work for them. 'Cos I’m a musician, my job is to help people enjoy my music at least while they listen to my music. It doesn't matter about any cultural difference for playing music. I have to think about it only to communicate with people who have cultural differences, to understand and respect each other. The relationship between music and other forms of art – painting, video art and cinema most importantly - has become increasingly important. How do you see this relationship yourself and in how far, do you feel, does music relate to other senses than hearing alone? I have no idea, 'cos I just play music even though I’m interested in other forms of art. If anyone is interested in working together or using my music, then something might happen. I don't know what will happen yet. There seem to be two fundamental tendencies in music today: On the one hand, a move towards complete virtualisation, where tracks and albums are merely released as digital files. And, on the other, an even closer union between music, artwork, packaging and physical presentation. Where do you stand between these poles? No idea. Anyway, I’m really an anachronism when it comes to this kind of thing. I’m not a businessman. The most important thing for a musician is just to play good music. That’s all. The role of an artist is always subject to change. What's your view on the (e.g. political/social/creative) tasks of artists today and how do you try to meet these goals in your work? No idea. 'Cos nobody knows any future. It’s totally pointless to think about the future. I just live in this moment. That’s all, that's enough. Music-sharing sites and -blogs as well as a flood of releases in general are presenting both listeners and artists with challenging questions. What's your view on the value of music today? In what way does the abundance of music change our perception of it? My music is mine until it's released. But after releasing, music is for the people. Music is like this. It should be like this. I've always said my music is copyleft, not copyright. Anyone can use my music. But I need to get enough money to live too, so I’ve asked people who like my music to "please don't upload any official release on free music share sites." I just wanna trust people who like my music. No idea. I’m not a businessman. I’ve always just tried to play better than yesterday. Usually, it is considered that it is the job of the artist to win over an audience. But listening is also an active, rather than just a passive process. How do you see the role of the listener in the musical communication process? I just play music for people who need my music. If they really need my music, then my music will reach them one day. I believe it. Honestly, I don't trust any mass communication and mass media. So I've been totally closed to any Japanese media and music journalism for 15 years. No interview, nothing to send, no promotional stuff, never invited to our shows. 'Cos they've never respected musicians. Also it looks like music journalism has such a cozy relationship with big record companies. By the way, our principle is D.I.Y. since the beginning. We promote with our hands, like posting to SNS, updating our website, distributing handbills, etc. I can believe the grapevine rather than any music journalism. Please recommend two artists to our readers which you feel deserve their attention. My music is mine until it's released. But after releasing, music is for the people.